Today, after rebooting from some Windows updates, my RAID1 disk suddenly was write protected – but a way to change it was nowhere to be found. After some digging, I found that others have reported the same problem. As far as I can tell, it seems to be a weakness in the 64-bit drivers for the on-board RAID on some motherboards that causes it. For the record, mine is a Gigabyte GA-EP45-UD3P, and I’m running Windows 7 RC (7100) 64bit, but it seems to be reported for all 64 bit versions of Windows. Anyhow, the fix itself is simple, and seems to stick over reboots, and hopefully it’s permanently fixed. To solve the problem, we need to open an elevated command prompt; in both Windows 7 and Vista, you do this easily by hitting the Windows button, typing “cmd”, right-clicking the “C:\ cmd” search result, and selecting “Run as administrator”. 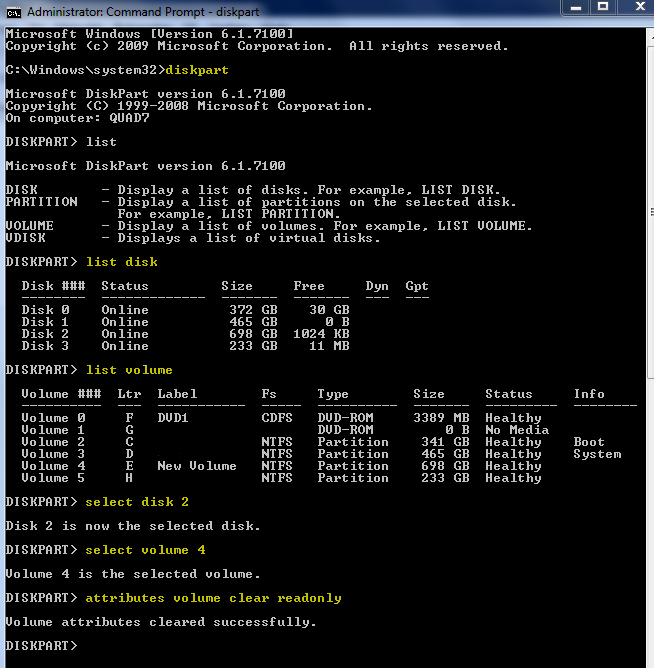 In Windows 7 you can also find Command Prompt in the Start menu and Ctrl-Shift-click it, to open it elevated.